One thing that was cool about this little show was that included work by several Houstonians. And they were placed in the same galleries as artists like Nick Cave, Julie Mehretu, Ed Ruscha, and Fischli & Weiss, which is pretty flattering. Two of the Houston artists on display already have national reputations. Mark Flood is about to have a solo show at the Saint Louis Contemporary Art Museum, and Trenton Doyle Hancock's recently closed show at the CAMH has traveled to the Akron Art Museum. So the MFAH doesn't risk any hint of provinciality by showing those two artists. I don't know how important that is to the MFAH--it's certainly not something they'd admit in public, anyway. But let's face it--you don't become a "world class" museum by showing a bunch of local yokels. They were also showing a Jim Love sculpture, although curiously it was not a piece from the museum's collection. It belongs to the Alley Theatre. The last two pieces were the most interesting in the sense that neither artist is particularly well known outside Houston. So the MFAH is, in a sense, taking a chance with these artists by saying they deserve to be displayed in the company of unimpeachably important contemporary artists like Cave, Mehretu and Ruscha. So why Jeremy DePrez and Michael Crowder and not, say, Emily Peacock or Robert Pruitt? I'm not making a value judgment here--just expressing curiosity about how particular works of Houston area artists end up in the MFAH. OK, I've been a bit coy. The thing is, for each of these artworks, the wall-label explains where the work came from. Why these works ended up in the collection is up for speculation. There is a gate-keeping process, but what appeals to a particular curator is ultimately unknown. But at least we know the "whence." Peacock was a "museum purchase funded by various donors and friends of the artist." Beacon was a "gift of Cecily E. Horton in honor of the twenty-fifth anniversary of the Core Program." Hancock was a Core fellow from 2000 to 2002. Air amusé was a "museum purchase funded by Wade Wilson, Jackie Wolens Mazow, Richard H. Moiel and Katherine S. Poeppel." Wade Wilson is a gallerist who shows Crowder's work. (We have reviewed Crowder's work here twice.) 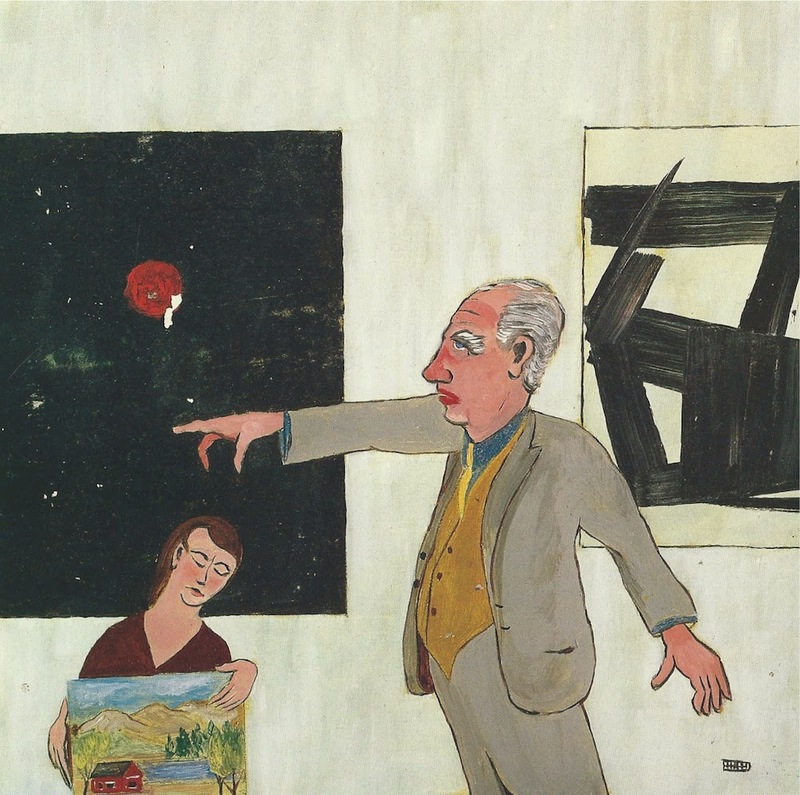 The untitled DePrez painting was a "gift of Fredericka Hunter and Ian Glennie." Hunter is the owner of Texas Gallery, where Glennie is the director. Texas Gallery exhibited work by DePrez in 2013 (a show I reviewed). DePrez is the youngest of the Houston artists here--he was born in 1983 and got his MFA from UH in 2011. So how did this piece end up in the MFAH? I asked Alison de Lima Greene, MFAH's Curator for Contemporary Art and Special Projects, about it. She told me that "in the case of Jeremy, his gallery invited me to look at the work and make a choice if I thought any would be good for our collection." But even at that point, there is a process for accessioning the work that she describes as "rigorous." "After the curator and director agree that the object has relevance to the collection (which is separate from monetary value) we first present it to appropriate departmental subcommittee which is made up of a mixture of trustees, collectors, and generally knowledgeable people in that particular field. Then if the subcommittee approves, the recommendation goes to our collections committee which is made up of experienced trustees, who have final say," de Lima Greene explained. Why would Wade Wilson and Fredericka Hunter want to give away work by an artist at their gallery? They're in the business of selling it, after all. The answer is pretty obvious--being in a museum collection confers legitimacy on an artist. In other words, it's branding. I realize this seems crass, and artists often recoil from this sort of thing--after all, the value of the work should be the work itself, not some story about its credentials--and in any case, that value shouldn't be measured in dollars. But gallerists have to live in the real world where artists and landlords and the power company all get paid lest bankruptcy and lawsuits ensue. So good branding is key to their continued existence. Each label contained one more piece of data--a number. DePrez's was 2013.334. Beacon's was 2007.1693. This is the year the work was acquired and which work it was in order of all the works acquired that year. So in 2007, at least 1693 works were acquired by the MFAH. This tells you that at any given time, only a tiny percentage of the museum's holdings can be displayed at one time. This perhaps more than any fear of provincialism likely explains why more Houston artists don't have work on display at any given time. (In addition to the works in this exhibit, a small James Bettison work was on display downstairs.) Not that the museum doesn't have a fraught history with local art. James Johnson Sweeney, director from 1961 to 1967, infamously ended the annual regional exhibition, which provided many Houston area artists with important exposure to viewers who might not ever otherwise see their work. Needless to say, this went over pretty poorly with local artists, as demonstrated by Frank Freed's 1966 painting Out! depicting Sweeney ejecting a local painter from the museum. Personally, I would like to see more local art exhibited at the MFAH. But its relatively small size combined with its huge collection combined with a mission to be world class institution makes this difficult. I'm hoping that when the new building is completed, which will be focused primarily on art since 1900, there will be more opportunities for the display of art by Houston's own artists.